Hakata River running through Hakata and Tenjin districts at the center of Fukuoka City gave off a terrible smell and gas in the past due to deteriorated water quality as it was a tidal river without flow. Therefore, reclamation was discussed from time to time. 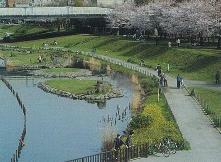 In 1990, Fukuoka City developed the “Hakata River Dream Corridor Project” (“Hakata River Improvement Concept”), and this environmental improvement (including waterfront improvement) project has been promoted while urban area redevelopment project is conducted in addition to river environment improvement. 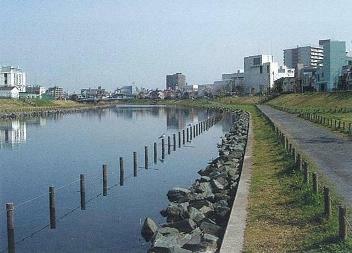 Murasaki River flowing through the inner-city area of Kitakyushu City was listed as a “My Town, My River Improvement Project (A Waterfront Plan project)” river in 1988. 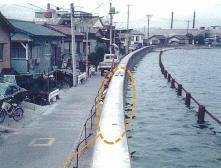 Since then, urban infrastructure improvement including river and surrounding urban development has been conducted. In the Murasaki River Bashaku district, various approaches are adopted, which include not only flood control projects but also waterfront park and road improvement and urban district vitalization to enhance private developers’ potentiality to create a town centering on the river. 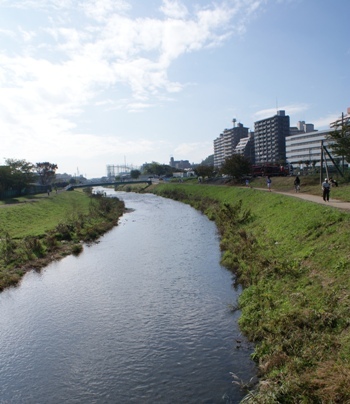 For Ota River flowing though Hiroshima City, the national, prefectural, and city governments together developed a framework called “A Lagoon City of Hiroshima” in January 2003 to take progressive approaches toward the regeneration of a lagoon city in the green river area expanded in the postwar period. In this framework, three pillars of “to use,” “to create,” and “to connect” are provided to take the lead in social experiments in waterfront utilization and conduct waterfront restoration activities with the collaboration of citizens, companies, and government. For Dotonbori River or the river representing Osaka, the walking trail has been improved as part of a project to regenerate “the lagoon city of Osaka,” by which people can feel familiar with water. By improving the flood gates that have the functions of water purification, tide prevention, and lockage, waterfront environmental improvement in the peripheral areas has been achieved. Regarding Hori River flowing north to south through the center of Nagoya City, there were industrial areas consisting of many factories and warehouses along the river and urban areas full of commercial facilities and residences built with their backs to Hori River. Additionally, the water quality was very deteriorated, which led to diminishment of the vibrant atmosphere. In this situation, a movement to regenerate Hori River, or the mother river of Nagoya, flourished and the river was listed as a “My Town, My River Improvement Project (A Waterfront Plan project)” river in June 1988. 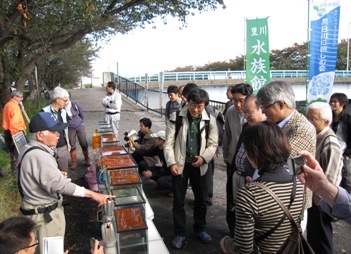 Since then, the Hori River restoration project has been conducted by the Nagoya City government and the local citizens. Source: Sep. 2006 Tokyo Metoropolitan Govt. In watershed areas of the Old Naka River, because the surrounding ground is low, a river development project has been conducted to lower the water level to prevent flooding. Together with this project, highly water-attracting, beautiful waterfront spaces have been regenerated without damaging the river environment. Tama River, with Ogouchi Dam (called Okutama Lake), completed in 1957, and with tourist facilities, has been a relaxation and recreation area for Tokyoites. But its midstream and downstream in Tokyo and Kanagawa have been urbanized as residential and industrial areas. During the high-growth period in 1965-75, its water quality was deteriorated and the variety of the water usage increased. Residents gradually needed more orderly space usage. Recently natural life has returned to the area as the sewage system penetrated and the water quality improved. In watershed areas of Meguro River flowing through Tokyo, urbanization has been promoted since the Meiji Period, and the water quality was extremely deteriorated in the high-growth period. Then, bubbles of detergent floated on the water surface and unpleasant odors were produced over a long period. Later, the water quality and scenery were dramatically improved through the introduction of sewage systems and local citizens’ efforts. However, there are many combined sewer systems in the watershed area of Meguro River even today, and there are some problems such as the river giving off a bad odor at times of flooding. Currently, various approaches aiming at water environment improvement such as releasing reclaimed sewage water and water purification experiments by using highly concentrated oxygen dissolution water are being conducted to restore the watershed areas where people can enjoy cherry-blossom viewing. In the high-growth period, human sewage was fed into this river and the water quality was extremely deteriorated. In recent years, however, due to river improvement balancing flood control and environmental preservation with specific efforts for collaboration between citizens and administration in addition to improvement of the surrounding sewer network, the water quality and river environment has been improved greatly. In the downstream area of Saitama Prefecture, this area is used as a water-attracting park because the bank protection work is small scale and the water-attracting qualities are high. In particular, in the downstream area in the north of Niiza City, many people enjoy fishing and the tranquil Musashino landscape is preserved as there is no residential area. In the upstream site of Higashikurume City, Tokyo, a cycling road has been built on either bank, where many people enjoy walking. The Kurome River was awarded grand prix in the 5th “Iikawa & Iikawa-zukuri” workshop (old name: River’s day workshop in Japan) in Sep. 2012. In this page, major river and waterfront restoration projects and photographs in Japan are introduced.